Manchester City's visit to the King Power Stadium becomes a disaster from start as an early goal by Vardy who hasn't been on target for three months was recorded in just three minutes. football analyst before the start of the game due lack of form, doomed for Relegation but vindicated by this uplifting three minute goal to score three by half time whistle (3-0), two by the famous Vardy Power. The second goal by Andy King was also assisted by the Slimani, a perfect pass from a ball he got from a sluggish throw was enough for King to send 2 Goals ahead of City. This wasn't enough for the Leicester side, having suffered too much before today, it was better for the Claudio Ranieri showed the Pep Guardiola side they had been in their shoes last season. By twenty minutes, the game was 3-0 as Vardy scored his second, which is the third for his team. A nice assist from Mahrez was enough for Vardy to flick home the third. 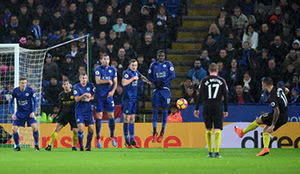 Manchester City enjoyed most of the possession in the second 45 but nothing had came out of their long hold on the ball but Leicester kept on hitting their visitors each time the ball came into their feet. 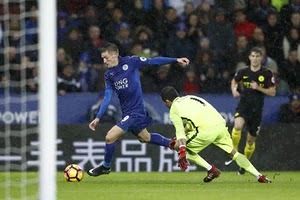 Vardy completes his Hat-trick at 79 minutes, completely demoralizing the thinking of a possible come back for City though Kolarov, Nolito found the end of the net at the 82nd and last minute respectively, but it wasn't sufficient for the downcasted City side. 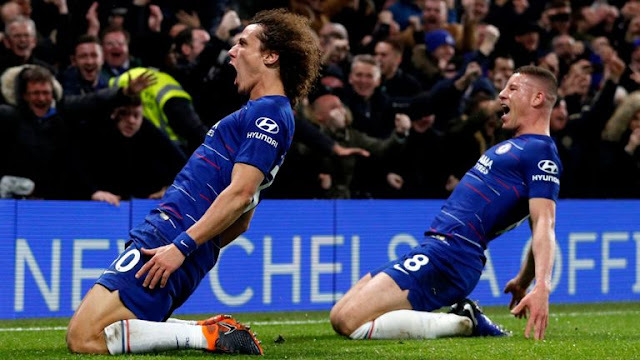 The Game ends with Manchester City going with nothing this time and Leicester celebrating their first win in a very long while lifting them to the 14th position, while City might just fall out of the top four position, if Tottenham wins.